Expand your lace knitting expertise to include elegant, in-the-round projects alongside knitwear designers Courtney Kelley and Kate Gagnon Osborn. 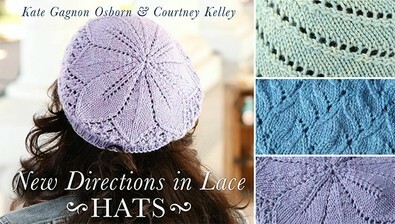 Get comfortable reading lace charts and joining in the round to knit the simply chic Spiral Lace Hat from the bottom up. Master Courtney's invisible cast-on and work the Medallion Crown Hat (a beautiful beret) from the top down before binding off in pattern. Knit the True Lace Hat with patterning on every round, and receive tips for modifying the length or circumference of your hats. Plus, discover finishing techniques for weaving in ends securely and blocking your hats for crisp stitch definition. Learn to knit lace in the round and light up your look with these exclusive, alluring accessories.